Located in the tranquil village of Vourvourou, the Vourvourou Mainland Estate Villas are the absolute epitome of luxury and indulgence. What could be better than waking up to the crystal clear waters of the Aegean Sea, the cloudless blue skies of the Mediterranean and the gentle warmth emanating from the morning sun. All with excellent facilities and perfect for immersing yourself in a haven of serenity and repose, there are three villas to choose from. Each is the epitome of chic refinement and offers a perfect sanctuary of luxury, ideal for a relaxing holiday in Greece. We have fallen in love with the spectacular views, seclusion and privacy that these properties offer. All of the villas are located in superb natural landscapes with accommodation and facilities that are of the highest standards. Personalised service and exemplary attention to detail will ensure you have the most memorable of stays. 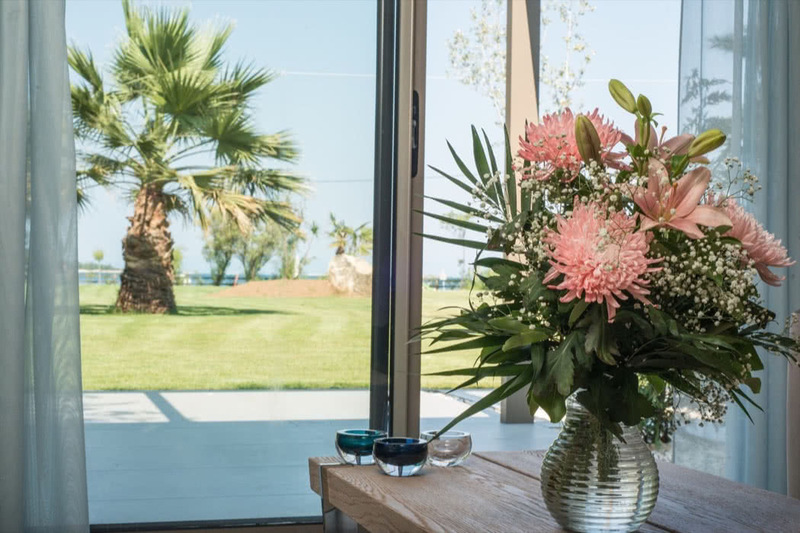 Away from the hustle and bustle, the villas are located in a new secret eco-paradise on the second of the three peninsulas of Halkidiki, in Sithonia, in the north Aegean Sea. Known across the world for its natural beauty, Vourvourou lies 96 km / 70 minutes drive from the Macedonia International Airport of Thessalonik. Its stunning complex of charming beaches is set amongst a background of pine-covered hills and lush green vegetation. Vourvourou is a small settlement which has been developed along the beach and boasts sandy beaches, undisturbed coastlines and calm waters. Opposite is a cluster of nine small islands, the largest of which is Diaporos which can be accessed by boat. If you fancy a stroll, walk the footpaths of Itamos and enjoy the magical views across the stunning blue lagoon and the whole of Halkidiki. With its warm mild Mediterranean climate, Vourvourou is nice to visit any time of the year however, if you are looking for sunshine and comfortable temperatures, the months of May, June and September are perfect. Beaches tend to be quieter during these months compared to the high season of July and August. 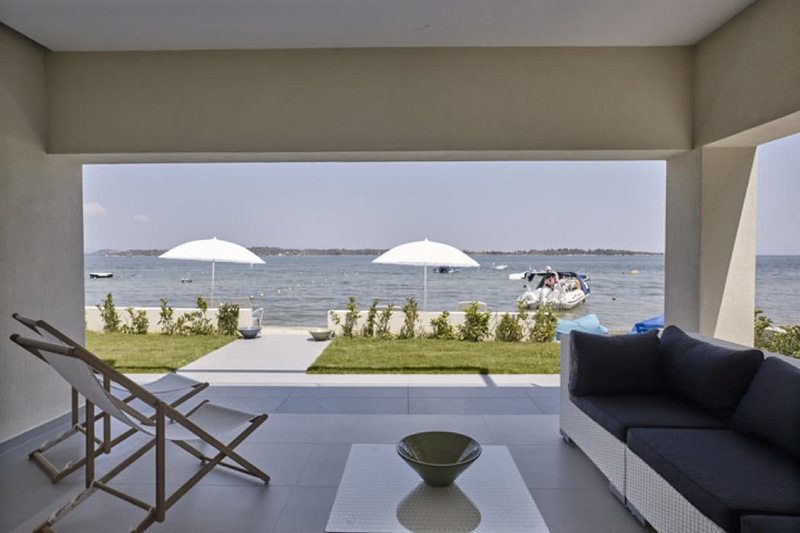 You can catch a direct flight from the UK to Thessaloniki International Airport and then travel by car to the Vourvourou Mainland Estate Villas. The drive will take approximately 90 minutes and a private transfer to your luxury villa will be organized for you by Tiamo Secrets . This exquisite villa comprises of a main two storey residence and a separate studio with an exceptionally spacious outside area which boasts a very impressive BBQ area set in the beautifully maintained gardens. The main villa has two double bedrooms with the most amazing terrace overlooking the Aegean waters. You are so close to the sea you can almost reach out and touch it! This is the perfect place to sit with a morning coffee and watch the relaxed comings and goings of the local fishing boats. 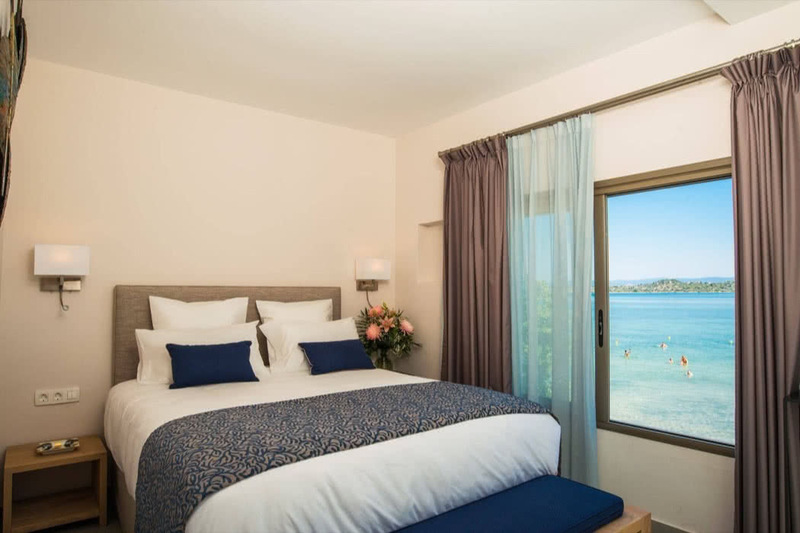 Another double bedroom can be found in the Studio apartment and as with the main villa, enjoys the luxurious touches of superior quality linen, King/Queen sized bed and espresso coffee machine. 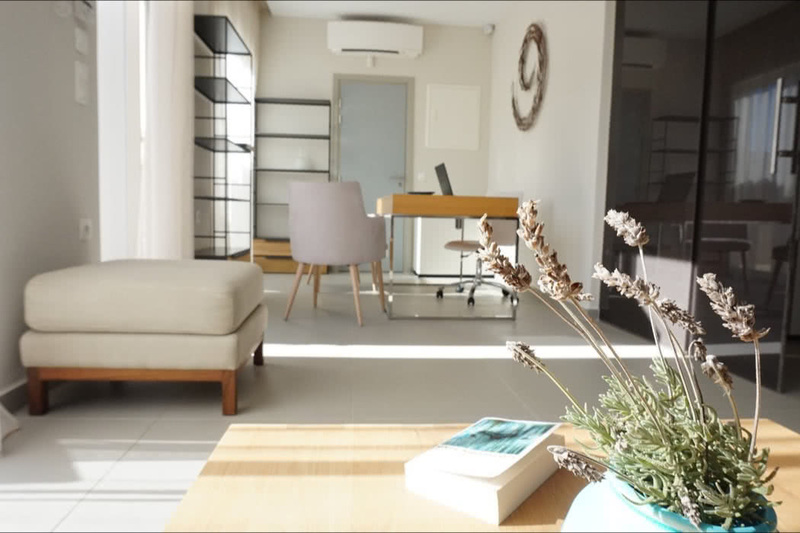 Inside the decor is beautifully contemporary with simple cool colourings and comfortable furnishings. The well equipped kitchen links perfectly to the lounge area from which there is a shaded seating area that can be accessed through patio doors. A few more steps and you are onto the beach with your very own sun loungers. 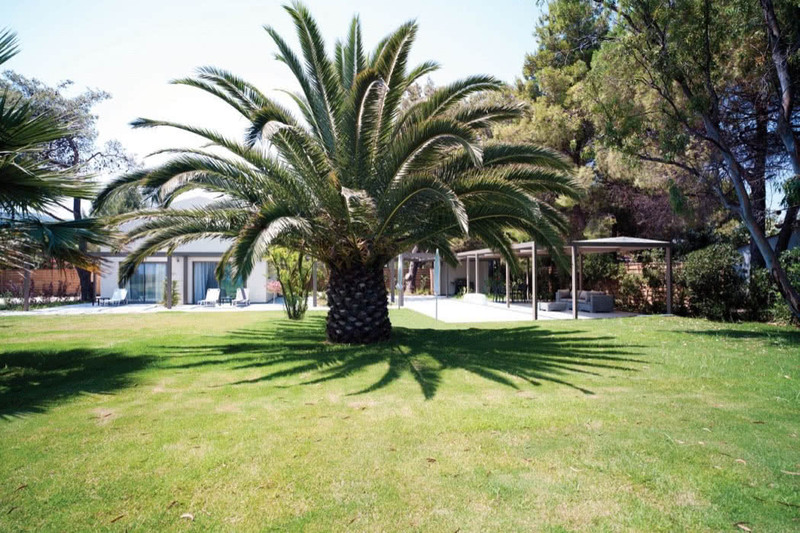 As the name of this villa suggests, it is set in amongst a beautiful palm tree filled garden. With all the elegance and style of the Beach Front villa, Palm Garden is a hidden treasure, perfectly secluded and protected by the lush vegetation surrounding it. If you are looking for freedom and privacy then this villa is for you. The vast garden provides ample space for relaxation. A short stroll through the magnificent flora and you will discover a gorgeous beach with is sandy shore and gentle waters. Inside there are two luxurious double bedrooms with king and queen sized beds, a fully equipped kitchen with dining area and lounge. Another amazing terrace awaits you with beautiful views across the garden and to the Aegean coastline in the distance. And no luxury villa would be complete without that all important BBQ, essential for cooking up a late lunch after a morning on the beach. With such a great garden space to explore, this villa is perfect for a family and Tiamo Secrets are happy to organise a baby cot to accommodate the younger visitors in your party. The final villa in this compilation of three is the simply stunning River Beach. This delightful one bedroomed villa is a perfect couple’s retreat and with the addition of a sofa bed, it affords the flexibility to accommodate up to four people, ideal for a family. The king size bed, Jack and Jill sinks and luxurious extras such as natural beauty products, soft towels and dressing gowns, all add to that feeling of opulence and compliments the tastefully decorated interior. The kitchen has everything you need to rustle up a Greek feast and includes that all important espresso coffee machine and the even more important wine cooler! 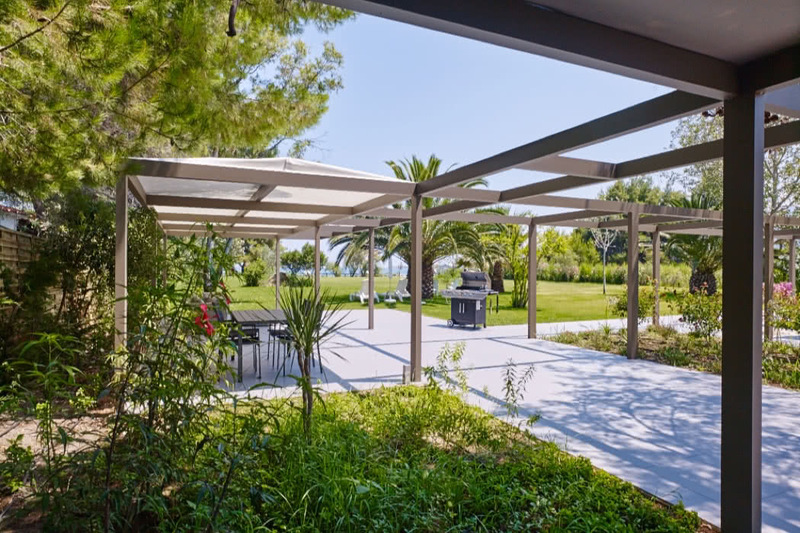 The beautiful terrace with its lounge area, umbrellas and BBQ, guarantees total relaxation and the views across the garden and twinkling shores of the Aegean, are out of this world. If you want to stay at this or any other luxury hotel, contact our luxury travel concierge for free upgrades, free breakfasts, deals and VIP gifts at no extra cost.